Plants are perceived as green because chlorophyll absorbs mainly the blue and red wavelength and reflects the green. 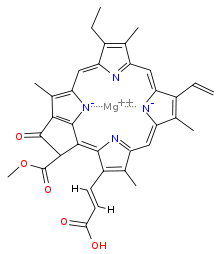 There are several types of chlorophyll, but all share the chlorin magnesium ligand which forms the right side of this diagram. Chlorophyll (also chlorophyl) is any of several related green pigments found in cyanobacteria and the chloroplasts of algae and plants. Its name is derived from the Greek words χλωρός, chloros (“green”) and φύλλον, phyllon (“leaf”). Chlorophyll is essential in photosynthesis, allowing plants to absorb energy from light. Chlorophyll was first isolated and named by Joseph Bienaimé Caventou and Pierre Joseph Pelletier in 1817. The presence of magnesium in chlorophyll was discovered in 1906, and was the first time that magnesium had been detected in living tissue. After initial work done by German chemist Richard Willstätter spanning from 1905 to 1915, the general structure of chlorophyll a was elucidated by Hans Fischer in 1940. By 1960, when most of the stereochemistry of chlorophyll a was known, Robert Burns Woodward published a total synthesis of the molecule. In 1967, the last remaining stereochemical elucidation was completed by Ian Fleming, and in 1990 Woodward and co-authors published an updated synthesis. Chlorophyll f was announced to be present in cyanobacteria and other oxygenic microorganisms that form stromatolites in 2010; a molecular formula of C55H70O6N4Mg and a structure of (2-formyl)-chlorophyll a were deduced based on NMR, optical and mass spectra. Chlorophyll molecules are arranged in and around photosystems that are embedded in the thylakoid membranes of chloroplasts. In these complexes, chlorophyll serves three functions. The function of the vast majority of chlorophyll (up to several hundred molecules per photosystem) is to absorb light. Having done so, these same centers execute their second function: the transfer of that light energy by resonance energy transfer to a specific chlorophyll pair in the reaction center of the photosystems. This pair effects the final function of chlorophylls, charge separation, leading to biosynthesis. The two currently accepted photosystem units are photosystem II and photosystem I, which have their own distinct reaction centres, named P680 and P700, respectively. These centres are named after the wavelength (in nanometers) of their red-peak absorption maximum. The identity, function and spectral properties of the types of chlorophyll in each photosystem are distinct and determined by each other and the protein structure surrounding them. Once extracted from the protein into a solvent (such as acetone or methanol), these chlorophyll pigments can be separated into chlorophyll a and chlorophyll b. The function of the reaction center of chlorophyll is to absorb light energy and transfer it to other parts of the photosystem. The absorbed energy of the photon is transferred to an electron in a process called charge separation. The removal of the electron from the chlorophyll is an oxidation reaction. The chlorophyll donates the high energy electron to a series of molecular intermediates called an electron transport chain. The charged reaction center of chlorophyll (P680+) is then reduced back to its ground state by accepting an electron stripped from water. The electron that reduces P680+ ultimately comes from the oxidation of water into O2 and H+ through several intermediates. This reaction is how photosynthetic organisms such as plants produce O2 gas, and is the source for practically all the O2 in Earth’s atmosphere. Photosystem I typically works in series with Photosystem II; thus the P700+ of Photosystem I is usually reduced as it accepts the electron, via many intermediates in the thylakoid membrane, by electrons coming, ultimately, from Photosystem II. Electron transfer reactions in the thylakoid membranes are complex, however, and the source of electrons used to reduce P700+ can vary. The electron flow produced by the reaction center chlorophyll pigments is used to pump H+ ions across the thylakoid membrane, setting up a chemiosmotic potential used mainly in the production of ATP (stored chemical energy) or to reduce NADP+ to NADPH. NADPH is a universal agent used to reduce CO2 into sugars as well as other biosynthetic reactions. Reaction center chlorophyll–protein complexes are capable of directly absorbing light and performing charge separation events without the assistance of other chlorophyll pigments, but the probability of that happening under a given light intensity is small. Thus, the other chlorophylls in the photosystem and antenna pigment proteins all cooperatively absorb and funnel light energy to the reaction center. Besides chlorophyll a, there are other pigments, called accessory pigments, which occur in these pigment–protein antenna complexes. Chlorophylls are numerous in types, but all are defined by the presence of a fifth ring beyond the four pyrrole-like rings. Most chlorophylls are classified as chlorins, which are reduced relatives to porphyrins (found in hemoglobin). They share a common biosynthetic pathway as porphyrins, including the precursor uroporphyrinogen III. Unlike hemes, which feature iron at the center of the tetrapyrrole ring, chlorophylls bind magnesium. For the structures depicted in this article, some of the ligands attached to the Mg2+ center are omitted for clarity. The chlorin ring can have various side chains, usually including a long phytol chain. The most widely distributed form in terrestrial plants is chlorophyll a. In diethyl ether, chlorophyll a has approximate absorbance maxima of 430 nm and 662 nm, while chlorophyll b has approximate maxima of 453 nm and 642 nm. The absorption peaks of chlorophyll a are at 465 nm and 665 nm. Chlorophyll a fluoresces at 673 nm (maximum) and 726 nm. The peak molar absorption coefficient of chlorophyll a exceeds 105 M−1 cm−1, which is among the highest for small-molecule organic compounds. In 90% acetone-water, the peak absorption wavelengths of chlorophyll a are 430 nm and 664 nm; peaks for chlorophyll b are 460 nm and 647 nm; peaks for chlorophyll c1 are 442 nm and 630 nm; peaks for chlorophyll c2 are 444 nm and 630 nm; peaks for chlorophyll d are 401 nm, 455 nm and 696 nm. By measuring the absorption of light in the red and far red regions, it is possible to estimate the concentration of chlorophyll within a leaf. Ratio fluorescence emission can be used to measure chlorophyll content. By exciting chlorophyll a fluorescence at a lower wavelength, the ratio of chlorophyll fluorescence emission at 6993705000000000000♠705±10 nm and 6993735000000000000♠735±10 nm can provide a linear relationship of chlorophyll content when compared to chemical testing. The ratio F735/F700 provided a correlation value of r2 0.96 compared to chemical testing in the range from 41 mg m−2 up to 675 mg m−2. Gitelson also developed a formula for direct readout of chlorophyll content in mg m−2. The formula provided a reliable method of measuring chlorophyll content from 41 mg m−2 up to 675 mg m−2 with a correlation r2 value of 0.95. In plants, chlorophyll may be synthesized from succinyl-CoA and glycine, although the immediate precursor to chlorophyll a and b is protochlorophyllide. In Angiosperm plants, the last step, the conversion of protochlorophyllide to chlorophyll, is light-dependent and such plants are pale (etiolated) if grown in darkness. Non-vascular plants and green algae have an additional light-independent enzyme and grow green even in darkness. Chlorophyll itself is bound to proteins and can transfer the absorbed energy in the required direction. Protochlorophyllide occurs mostly in the free form and, under light conditions, acts as a photosensitizer, forming highly toxic free radicals. Hence, plants need an efficient mechanism of regulating the amount of chlorophyll precursor. In angiosperms, this is done at the step of aminolevulinic acid (ALA), one of the intermediate compounds in the biosynthesis pathway. Plants that are fed by ALA accumulate high and toxic levels of protochlorophyllide; so do the mutants with the damaged regulatory system. Chlorosis is a condition in which leaves produce insufficient chlorophyll, turning them yellow. Chlorosis can be caused by a nutrient deficiency of iron — called iron chlorosis — or by a shortage of magnesium or nitrogen. Soil pH sometimes plays a role in nutrient-caused chlorosis; many plants are adapted to grow in soils with specific pH levels and their ability to absorb nutrients from the soil can be dependent on this. Chlorosis can also be caused by pathogens including viruses, bacteria and fungal infections, or sap-sucking insects. Superposition of spectra of chlorophyll a and b with oenin (malvidin 3O glucoside), a typical anthocyanidin, showing that, while chlorophylls absorb in the blue and yellow/red parts of the visible spectrum, oenin absorbs mainly in the green part of the spectrum, where chlorophylls don’t absorb at all. Anthocyanins are other plant pigments. The absorbance pattern responsible for the red color of anthocyanins may be complementary to that of green chlorophyll in photosynthetically active tissues such as young Quercus coccifera leaves. It may protect the leaves from attacks by plant eaters that may be attracted by green color. The chlorophyll maps show milligrams of chlorophyll per cubic meter of seawater each month. Places where chlorophyll amounts were very low, indicating very low numbers of phytoplankton, are blue. Places where chlorophyll concentrations were high, meaning many phytoplankton were growing, are yellow. The observations come from the Moderate Resolution Imaging Spectroradiometer (MODIS) on NASA’s Aqua satellite. Land is dark gray, and places where MODIS could not collect data because of sea ice, polar darkness, or clouds are light gray.The highest chlorophyll concentrations, where tiny surface-dwelling ocean plants are thriving, are in cold polar waters or in places where ocean currents bring cold water to the surface, such as around the equator and along the shores of continents. It is not the cold water itself that stimulates the phytoplankton. Instead, the cool temperatures are often a sign that the water has welled up to the surface from deeper in the ocean, carrying nutrients that have built up over time. In polar waters, nutrients accumulate in surface waters during the dark winter months when plants cannot grow. When sunlight returns in the spring and summer, the plants flourish in high concentrations. Chlorophyll is registered as a food additive (colorant), and its E number is E140. Chefs use chlorophyll to color a variety of foods and beverages green, such as pasta and spirits. Absinthe gains its green color naturally from the chlorophyll introduced through the large variety of herbs used in its production. Chlorophyll is not soluble in water, and it is first mixed with a small quantity of vegetable oil to obtain the desired solution. ^ May P. “Chlorophyll”. University of Bristol. ^ “chlorophyll”. Online Etymology Dictionary. ^ Muneer S, Kim EJ, Park JS, Lee JH (March 2014). “Influence of green, red and blue light emitting diodes on multiprotein complex proteins and photosynthetic activity under different light intensities in lettuce leaves (Lactuca sativa L.)”. International Journal of Molecular Sciences. 15 (3): 4657–70. doi:10.3390/ijms15034657. PMC 3975419. PMID 24642884. Speer BR (1997). “Photosynthetic Pigments”. UCMP Glossary (online). University of California Museum of Paleontology. Retrieved 2010-07-17. Delépine M (September 1951). “Joseph Pelletier and Joseph Caventou”. Journal of Chemical Education. 28 (9): 454. Bibcode:1951JChEd..28..454D. doi:10.1021/ed028p454. ^ a b Motilva M (2008). “Chlorophylls – from functionality in food to health relevance”. 5th Pigments in Food congress- for quality and health (Print). University of Helsinki. ISBN 978-952-10-4846-3. ^ Woodward RB, Ayer WA, Beaton JM, Bickelhaupt F, Bonnett R, Buchschacher P, et al. (July 1960). “The total synthesis of chlorophyll” (PDF). Journal of the American Chemical Society. 82 (14): 3800–3802. doi:10.1021/ja01499a093. ^ Fleming I (14 October 1967). “Absolute Configuration and the Structure of Chlorophyll”. Nature. 216 (5111): 151–152. Bibcode:1967Natur.216..151F. doi:10.1038/216151a0. ^ Woodward RB, Ayer WA, Beaton JM, Bickelhaupt F, Bonnett R, Buchschacher P, et al. (1990). “The total synthesis of chlorophyll a”. Tetrahedron. 46 (22): 7599–7659. doi:10.1016/0040-4020(90)80003-Z. ^ Jabr F (August 2010). “A New Form of Chlorophyll?”. Scientific American. ^ Infrared chlorophyll could boost solar cells. New Scientist. August 19, 2010. Retrieved on 2012-04-15. ^ Chen M, Schliep M, Willows RD, Cai ZL, Neilan BA, Scheer H (September 2010). “A red-shifted chlorophyll”. Science. 329 (5997): 1318–9. Bibcode:2010Sci…329.1318C. doi:10.1126/science.1191127. PMID 20724585. ^ Carter JS (1996). “Photosynthesis”. University of Cincinnati. Archived from the original on 2013-06-29. ^ Nature (July 5, 2013). “Unit 1.3. Photosynthetic Cells”. Essentials of Cell Biology. nature.com. ^ Marker AF (1972). “The use of acetone and methanol in the estimation of chlorophyll in the presence of phaeophytin in plant”. Freshwater Biology. 2 (4): 361–385. doi:10.1111/j.1365-2427.1972.tb00377.x. ^ Jeffrey SW, Shibata (February 1969). “Some Spectral Characteristics of Chlorophyll c from Tridacna crocea Zooxanthellae”. Biological Bulletin. 136 (1): 54–62. doi:10.2307/1539668. JSTOR 1539668. ^ Gilpin L (21 March 2001). “Methods for analysis of benthic photosynthetic pigment”. School of Life Sciences, Napier University. Archived from the original on April 14, 2008. Retrieved 2010-07-17. ^ Müller T, Ulrich M, Ongania KH, Kräutler B (2007). “Colorless tetrapyrrolic chlorophyll catabolites found in ripening fruit are effective antioxidants”. Angewandte Chemie. 46 (45): 8699–702. doi:10.1002/anie.200703587. PMC 2912502. PMID 17943948. ^ Gross J (1991). Pigments in vegetables: chlorophylls and carotenoids. Van Nostrand Reinhold. ISBN 978-0442006570. ^ Porra RJ, Thompson WA, Kriedemann PE (1989). “Determination of accurate extinction coefficients and simultaneous equations for assaying chlorophylls a and b extracted with four different solvents: verification of the concentration of chlorophyll standards by atomic absorption spectroscopy”. Biochimica et Biophysica Acta (BBA) – Bioenergetics. 975 (3): 384–394. doi:10.1016/S0005-2728(89)80347-0. ^ Larkum AW, Douglas S, Raven JA, eds. (2003). 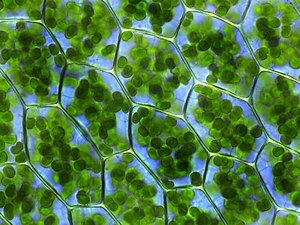 Photosynthesis in algae. London: Kluwer. ISBN 978-0-7923-6333-0. ^ Cate T, Perkins TD (September 2003). “Joseph Pelletier and Joseph Caventou”. Journal of Tree Physiology. 23 (15): 1077–1079. doi:10.1093/treephys/23.15.1077. ^ Gitelson AA, Buschmann C, Lichtenthaler HK (1999). “The Chlorophyll Fluorescence Ratio F735/F700 as an Accurate Measure of Chlorophyll Content in Plants”. Remote Sens. Enviro. 69 (3): 296–302. doi:10.1016/S0034-4257(99)00023-1. Meskauskiene R, Nater M, Goslings D, Kessler F, op den Camp R, Apel K (October 2001). “FLU: a negative regulator of chlorophyll biosynthesis in Arabidopsis thaliana”. Proceedings of the National Academy of Sciences of the United States of America. 98 (22): 12826–31. Bibcode:2001PNAS…9812826M. doi:10.1073/pnas.221252798. JSTOR 3056990. PMC 60138. PMID 11606728. Duble RL. “Iron Chlorosis in Turfgrass”. Texas A&M University. Retrieved 2010-07-17. ^ Karageorgou P, Manetas Y (May 2006). “The importance of being red when young: anthocyanins and the protection of young leaves of Quercus coccifera from insect herbivory and excess light”. Tree Physiology. 26 (5): 613–21. doi:10.1093/treephys/26.5.613. PMID 16452075. ^ Chlorophyll : Global Maps. Earthobservatory.nasa.gov. Retrieved on 2014-02-02. ^ Adams J (2004). Hideous absinthe : a history of the devil in a bottle. United Kingdom: I.B.Tauris, 2004. p. 22. ISBN 978-1860649202.